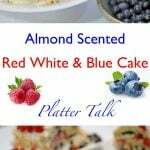 Almond Scented Red White & Blue Cake celebrates the colors and flavors of summer. 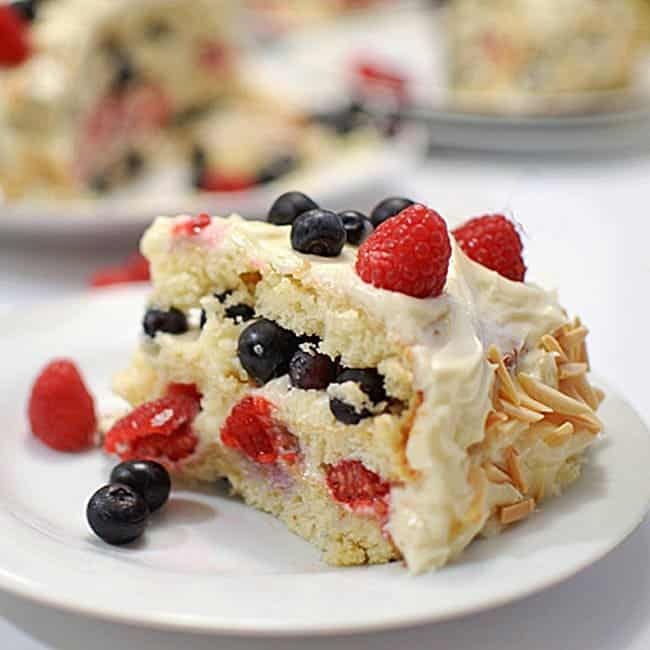 Red raspberries and plump, juicy blueberries are sandwiched between layers of white almond scented cake, all held together by a white butter cream cheese frosting. 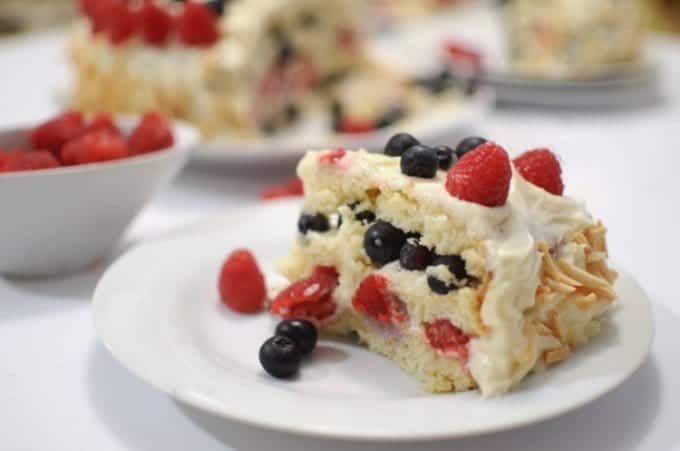 Our friends over at The Daily Meal called upon us to come up with a Red White and Blue creation and as we’ve done many times in the past, we were all too happy to oblige. We’ve been on somewhat of a raspberry kick lately, creating that delicious raspberry brownie baklava that we did a few weeks ago. Once again, raspberries seemed like a great choice for this part of our patriotic-themed recipe. Since I can’t use enough fresh blueberries in the kitchen, they were a shoe-in for our blue component. Now, we needed something white. Foraging through our fridge, I came across some cream cheese and then I found a recipe that essentially puts all the right things together and the end result: Almond Scented Red White & Blue Cake. 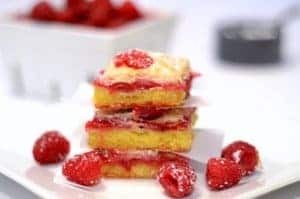 For whatever reason, I’ve never been one to take the easy road, but if I had not wanted to make my own white cake batter, I easily could have used a white cake mix from a box for this recipe. By the same token, there are many prepared white frostings available in the supermarket. Position a rack in the middle of an oven and preheat to 350ºF. Butter and flour 2 round cake pans each 9 inches in diameter and 1 1/2 inches deep. In a medium bowl, sift together the flour, baking powder and salt. In a large bowl, using an electric mixer set on medium-high speed, beat the butter until light. Gradually add the sugar, beating until well blended. Beat in the vanilla and almond extracts. Reduce the speed to low and, dividing the flour mixture into 3 batches, beat the flour mixture into the butter mixture alternately with the milk just until combined. In a large bowl, using an electric mixer fitted with clean, dry beaters and set on high speed, beat the egg whites until stiff peaks form. Using a rubber spatula, gently fold the beaten whites into the batter just until incorporated. Divide the batter between the prepared pans; smooth with the spatula. Bake until a toothpick inserted into the centers comes out clean, about 30 minutes. Transfer to racks and let cool in the pans for 10 minutes. Run a sharp knife around the pan sides to loosen the cakes. Invert onto racks and let cool completely. Meanwhile, make the cream cheese frosting: In a large bowl, combine the cream cheese and butter. Using an electric mixer set on medium-high speed, beat until smooth. Reduce the speed to low, add the confectioners' sugar and again beat until smooth. Beat in the vanilla and almond extracts until well blended. Using a long serrated knife, cut each cake in half horizontally. Place 1 layer on a plate. 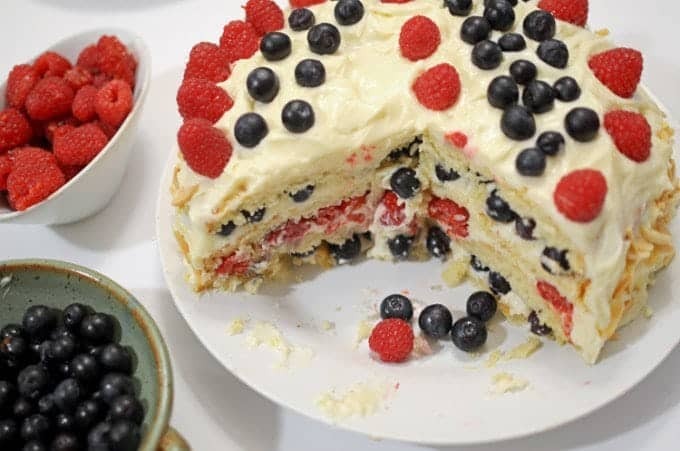 Spread 1/2 cup of the frosting over the top, then evenly layer with blueberries and press them into the frosting.. Top with another cake layer and evenly layer with raspberries. Top with a third cake layer and again repeat with the same amounts of frosting and blueberries. Top with the fourth cake layer, cut side down. Spread the remaining frosting over the top and sides. Ring the top with blueberries and raspberries, and press the toasted almonds onto the sides. Serve immediately, or cover with a cake dome and refrigerate for up to 1 day. Bring to room temperature before serving. Makes one 9-inch cake; serves 10 to 12. Use a white cake mix from a box if you don't want to make your own cake batter. 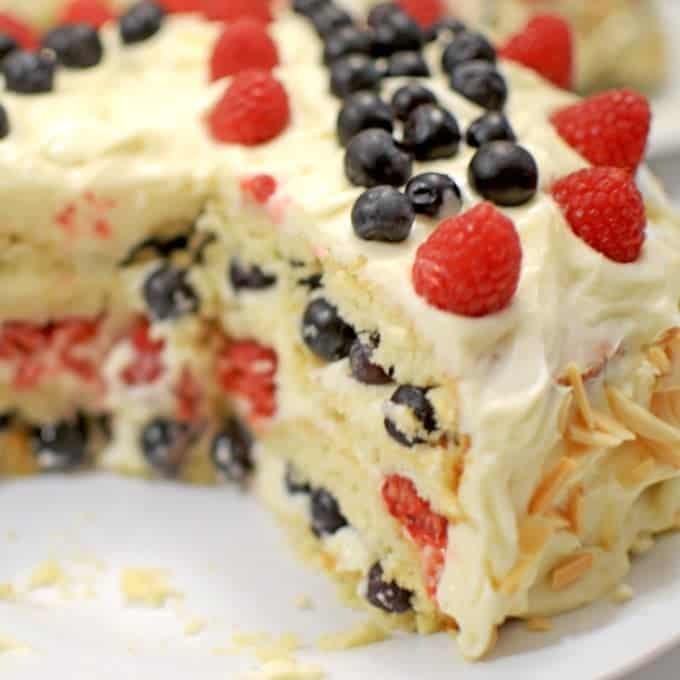 Delicious red and white blue cake simple and easy to make. Thank you; we enjoyed this cake! Such a pretty cake! I love the fruit you put inside, my favorite way to eat cake! Oh this looks divine! 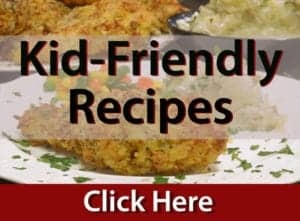 Love this recipe with the fruit in the middle! Love – thanks for sharing! That looks amazing! 😀 It would have been the perfect 4th of July! 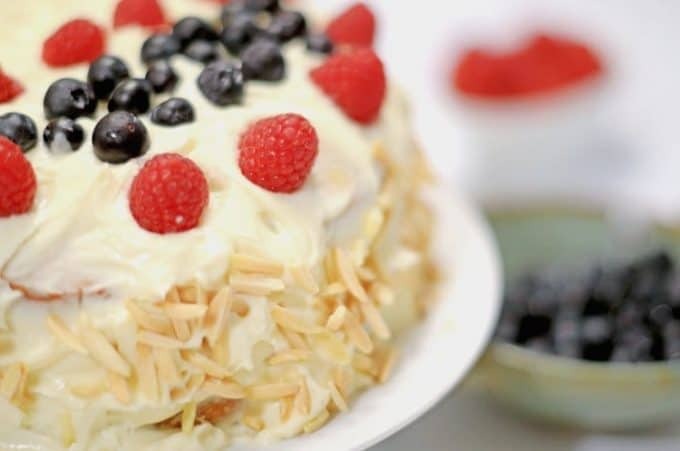 and adding the almond is brilliant too… Wish I had this cake to celebrate 4th of July 🙂 Thank you so much for linking up with us at #SaucySaturdays! What a beautiful cake! It looks so fresh and flavorful! Just beautiful! Thanks, Julie. We all enjoyed this colorful dessert! This cake looks so yummy! Perfect for 4th of July, but I would totally have this any time! Might have to make it for the next time we have a royal celebration in the UK! Stopping by from Saucy Saturday! Thanks so much, Michelle. For the record, I think you can enjoy this cake anywhere and for any occasion! Just delicious. Love the almond flavoring. And cream cheese frosting is my kryptonite. Yum. Thanks for linking! What a great dessert Dan! 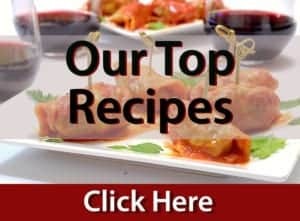 I love seeing red, white and blue recipes! Pinned and shared! This is absolute berry heaven! Fantastic Dan! This is utterly gorgeous! I love how light the cake is with the egg whites and it looks delicious too. Almond is the perfect partner to summer fruit. What a fantastic celebration cake! Beautiful cake. You’ve somehow made a cake look light! lol. I love the use of all those seasonal berries! It looks so delicious – light and full of flavor! What a beautiful cake, Dan! I love that you’ve not only infused the cake with the almond flavor, but also incorporated actual almond slivers. Also, this is a great way to use those summer berries. Look how plump and beautiful they look! I can just imagine eating this after a couple of hours, when the berry juices have soaked into the cake a bit…wow! Lovely job! We love desserts that use blueberries or raspberries! My raspberry bushes are going crazy…now I know what I can make! How lovely is this cake!! Not only beautiful but for sure spectacular in flavor as well!!!! Perfect for 4th of July! Thanks, Angela; we enjoyed this one!